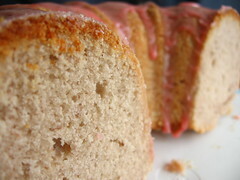 Strawberry Almond Bundt Cake - Do You Know The Muffin Man? Notes: I used the leftover sweetened strawberry puree from the chocolates to make this cake. My only substitutions were using sunflower oil instead of almond oil, and adding a few drops of strawberry essence to the batter. It took a full hour before the cake was fully baked. Moist with a medium crumb, very berry, but where's the almond? I think ground almonds in the cake would be better, or maybe some whole strawberries. Or using the suggested garnish. With 3/4 cup of puree in the batter, I was a teensy bit disappointed it didn't colour the cake more.